REPORT abuse against nurses whenever you safely can. SHARE this pledge and ask your friends and family to sign. You can take the pledge by texting PLEDGE to 52886 or going to p2a.co/japlwMm. 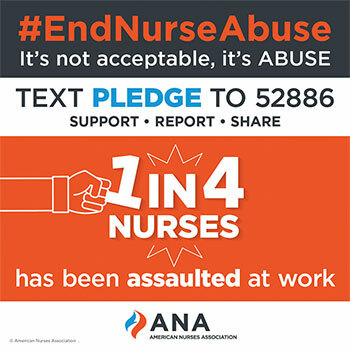 Learn more about ANA’s stand against workplace violence at www.nursingworld.org/MainMenuCategories/WorkplaceSafety/Healthy-Nurse/bullyingworkplaceviolence. Peer to Peer abuse is REAL ! I am writing due to an over whelming feeling that has burdened me over the last couple years being a nurse. I am very appreciative of movements such as this pledge to stop nurse violence; both physical and verbal. If I may, I would like to express one other piece of insight into this matter of how nurses are treated. Having experienced first hand and through the eyes of fellow nurses and healthcare professionals, I feel it has been time to address the significance of “mental” health. I know the term “mental” health is a taboo, but I fear not recognizing the trauma, anxiety, exhaustion that we as front line healthcare professional face, especially nurses, will be hurtful even more to the nurses and the people they care for. It seems as the “rush” to have patients satisfied and errors reduced only adds to more stress and anxiety. When is it time for US to have a voice. After all we went through rigorous training and schooling to head into career that doesn’t acknowledge in their “ACTIONS” that nurses are cared for. Giving praise is one thing, but setting a standard to actively support nurses during their hardships and struggles of the job is another measure to be taken. There is research to prove nurses are in high demand, yet nurses have one of the highest turnover and burn out rate amongst any other profession. WE as nurses truly understand this. And so I feel its important to try to connect with other like minded people to find a solution, if not a movement . My “idea” would be to have counselors or support groups accessible to every healthcare professional, especially nurses. As silly as that may seem to achieve, I truly believe its not within reach. Like anything, change does not happen over night. But I figured sometimes great ideas come from the woodworks of the people who experience the traumas and brutalities of what life throws at us. I hope this finds a reader who is empowered to at least hear this and acknowledge its more then just giving a voice, but also a solution to the problem. Thank you for reading this and keep up the woodwork with this movement!